Found one file extension association related to WISCO Survey Power and 1 file format developed specifically for use with WISCO Survey Power. WISCO Survey Power was used for customer satisfaction surveys, employee satisfaction surveys, and market research surveys. 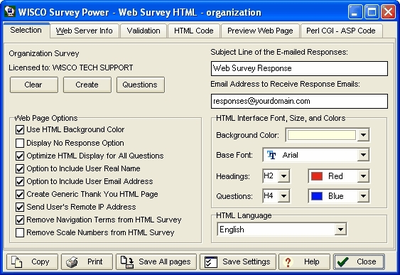 WISCO Survey Professional includes web survey creation, charting, data export, data import, and email survey data entry. The WISCO Survey Power software seems to be old or discontinued. If you need more information please contact the developers of WISCO Survey Power (www.wiscocomputing.com), or check out their product website.